Don’t let anyone tell you that playing with supernatural forces is not a game, because that’s precisely what it can be. In fact, children of the 1960s and '70s were frequently playing with monsters, ghosts and other forces unknown in the form of board games. In addition to that famous slumber-party favorite, the Ouija board – which is 125 years old but only became part of the Parker Brothers (later Hasbro) family in 1966 – kids could stalk around a cardboard haunted house, “run” from Dracula, transform into a creature or hang out with The Munsters or The Addams Family. 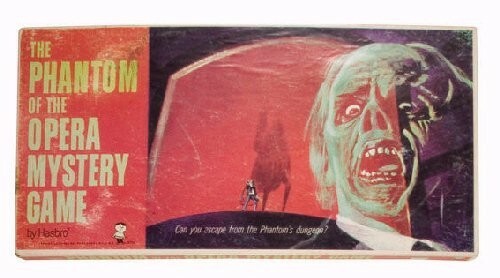 But what are the best vintage supernatural and horror-themed board games? To learn more, take a roll of the dice, and move your game piece ahead to my list of favorites (suggested for ages 6-12). Aside from Monopoly, this is likely the most famous board game of all time, and is a natural starting point. Named in 1890, and patented in 1891 by Charles Kennard and Elijah Bond, the Ouija board has always been sold as a game. Initially manufactured by the Kennard Toy Novelty company, Ouija operations were taken over by William Fuld in 1893. 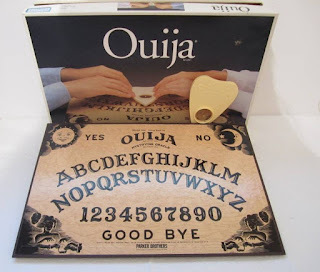 Fuld made the boards until 1966 when Parker Brothers bought Ouija for $1 million. By 1967, Parker Brothers was selling so many that management claimed they didn’t have one to use. While the Fulds had sold around 400,000 boards per year, more than two million moved in 1967, and accounted for $6 million for Parker Brothers (reportedly surpassing even Monopoly sales for Parker Brothers). The company also ran radio adverts for the board, including one with a rock ‘n’ roll beat, and the “Hey Ouija, we needja!” catchphrase. In the late 1960s, the company made three versions of the board, including a wooden edition. The game, initially suggested to be played by one male and one female, has its origins in Spiritualist talking boards and some suggest it opens a portal to the “other side.” When asked about the Ouija properties in 1967, Parker Brothers vice president Randolph Barton told The Chicago Tribune, “We don’t maintain that the Ouija board has supernatural powers … but there seems to be something mysterious about it all.” The game is currently still in production, and sold by Hasbro. 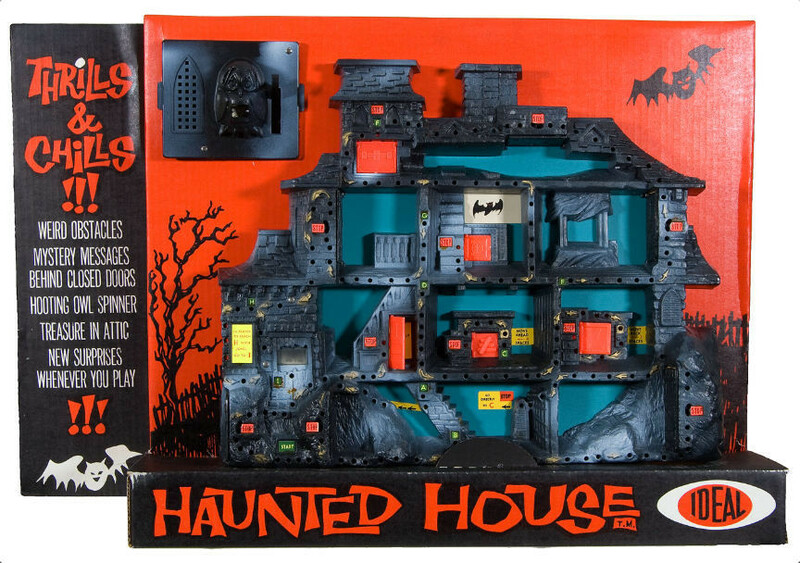 Produced by Ideal Toy Company (the same folks who bought the license to sell Erno Rubik’s cube), Haunted House is one of the most impressive games of its time on this list. As BoardGameGeek accurately points out, the 22" x 19" x 8" box is came in was massive, and so was the game it contained. The goal was for players to move through a standing, three-dimensional plastic house (featuring some excellent detail work). Using a hooting owl slot-machine spinner with lever, players could open secret doors on their way to an attic to obtain an all-important jewel, necessary to escape the haunted mansion. This game is not to be confused with the Which Witch?/Haunted House below. Enter the depths of the Black Lagoon! Find the lurking monster! Explore the ancient crypts of Egypt! Can you escape the Phantom’s dungeon? When will the werewolf strike? Will the vampire catch you? 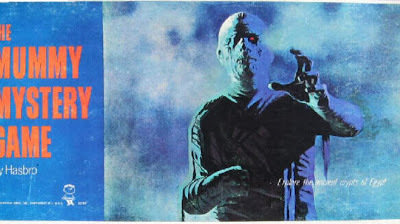 The Universal Monster Mystery Games were unleashed on the world in 1963 by Hasbro with The Creature from the Black Lagoon, Frankenstein, The Mummy, The Phantom of the Opera, The Wolf Man, and Dracula each getting their own version. 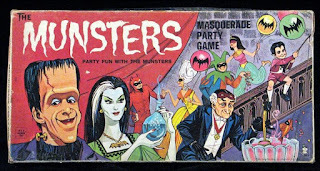 Each are spin-and-move games with cards (Dracula, Mummy, and Wolf Man include two spinners), and have player pieces that look like the famous monsters. Most are start-to-finish, without detours, although the Frankenstein game does offer more variety. The artwork on each of the boxes is pretty lovely, with my favorite being the Phantom’s. The Addams Family and The Munsters: Two family-centered “horror” sitcoms that debuted a week apart in 1964 (the former on a Thursday; the latter on the following Friday), and both ending in 1966 after two seasons. 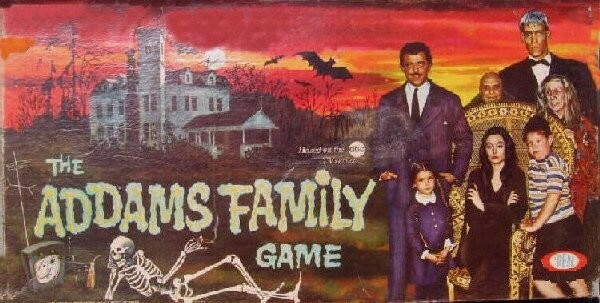 Both spawned games during their run, though The Munsters had four compared to two from The Addams Family. 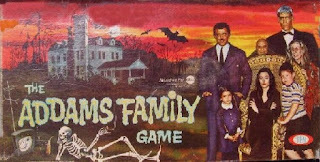 The 1964 Addams Family game is a straightforward game divided into seven cells, for each of the show characters. Players spin a wheel and draw good and bad outcome cards to reach home with generic pawns. 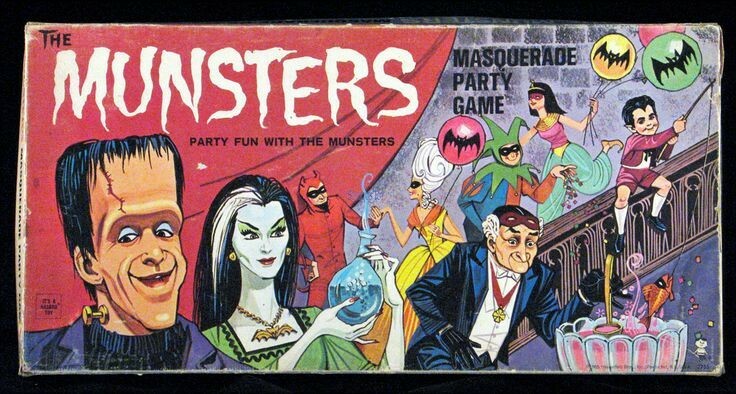 The Munsters Masquerade Party Game from 1965 was a little more fun “roll and move” game where players had pawns based on the show characters. As they progressed on the board, cards would instruct them to sing or perform imitations. 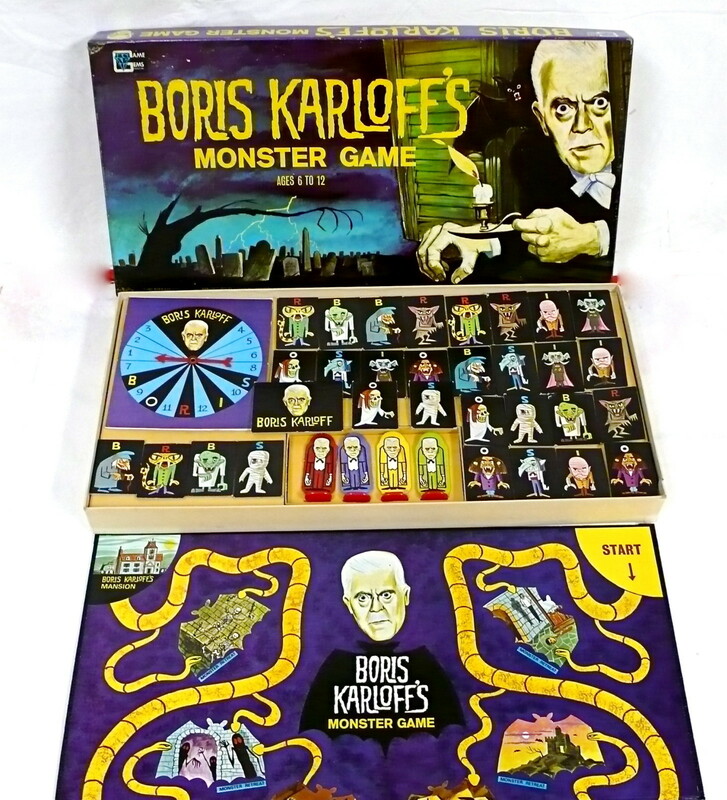 The point of Game Gems’ Monster Game is simple: Playing as either a red, purple, yellow, or green cartoony version of the horror icon, gamers must spin and move to make their way to the Boris Karloff Mansion. Along the way, however, they may be diverted to a “Monster Retreat,” or encounter of the B,O,R,I, or S cards featuring a variety of creatures. The gameplay is not complex, but the sheer joy/horror of playing as Boris just trying to get home is a kick. Plus, how many other kids games feature a scene with a hanging body, and a severed head from a guillotine? Created by Transogram, and later acquired by Marx Toys, Green Ghost is the “luminous game you can play in the dark” (and apparently the first such glow-in-the-dark game). 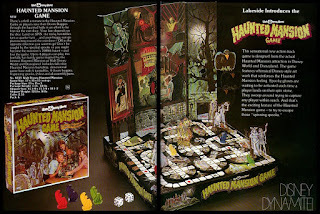 A giant green ghost spinner is searching for his 12 children, and directs players to move along a graveyard board on stilts. 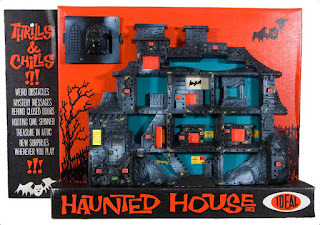 As they pass through “scenery,” such as a shipwreck or haunted house, they may fall through holes in the board, allowing them to open a crypt containing creepy-feeling items (snakes, bones, bat “feathers”), and one of the coveted ghost children. The game enjoyed a second life with a 1997 anniversary edition. This is not a game that would be released today, considering the darker elements to it, and how it encourages to torture opponents. That, along with the sweet design and artwork, make the Ideal Toy Company release a pretty great game even today. 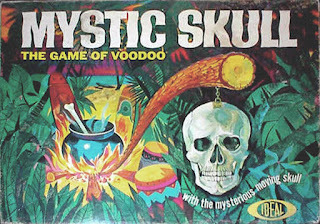 First up, players must stir a cauldron with a bone, which swivels a suspended skull (yeah, the mystic one) around the board on various voodoo spaces. Players can choose to place the instructed number of pins in any one of their opponents’ dolls, or elect to remove pins from their own. When a doll is full of pins, it is considered cursed, and is eliminated from the game. 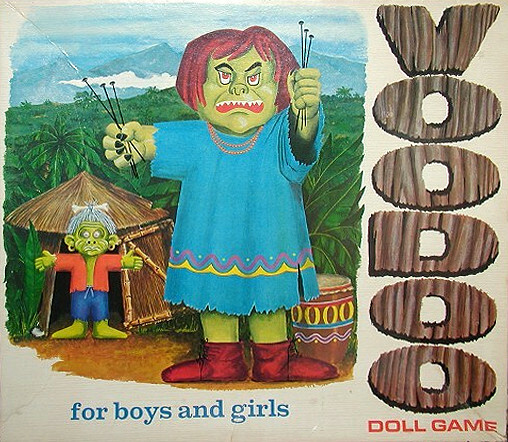 Hey, it’s a Voodoo Doll game “for boys and girls.” As opposed to Mystic Skull, which encouraged pinning an opponent, this Schaper game is based on torturing some nameless soul. The goal, like some reverse dark magic version of Operation, is to stick pins in a doll mounted on the board. Players keep pushing pins into the doll until the loser hits a trigger that unleashes a witch doctor figure from his plastic hut. I still can’t figure out why the ogre lady on the box, who is the basis for the doll in the game, is offering up pins for the players to stick. You’d think she might want to hide those suckers. When the gothic soap opera Dark Shadows debuted in June 1966, lead vampire Barnabas Collins was nowhere to be found. Instead, he showed up (played by Jonathan Frid) nearly a year into the show’s run. Meant to be a temporary character, the show quickly became all about the Barnabas, baby. Therefore, it is no surprise the show inspired two board games. The first, by Whitman Publishing, was released in 1968, and requires players to hold a hand of cards and strategize as they move across the board. The cartoonish artwork is great, but it’s the 1969 Barnabas Collins game that showcases our hero. 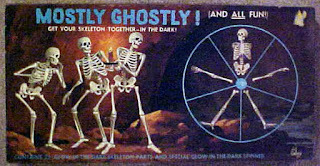 The point of this Milton Bradley game is to be the first to construct a plastic glow-in-the-dark skeleton on a scaffold. Bones are kept in a tiny Barny coffin, along with some stakes, which you can acquire via spinner. The game also comes with a set of plastic fangs that don’t figure into gameplay – but, heck, do you need a reason to have a set of Barnabas fangs? 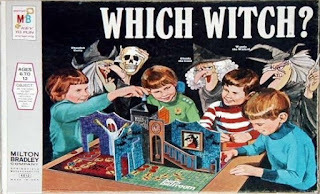 This classic by Denys Fisher Toys allows players to race their child-shaped pawns through a three-dimensional haunted house of witches Glenda the Good, Wanda the Wicked, or Ghoulish Gerty. 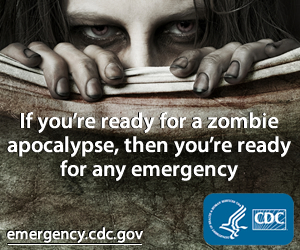 The goal is to escape first. As they move, they may draw cards turning them into a mouse, or freezing them in place. There is also a card that calls for a “whammy ball” to be dropped through the chimney piece, and roll into one of the rooms (Witch’s Kitchen, Spell Cell, Bat’s Ballroom, Broom Room) that can hit your pawn, and send you backwards. This was also released as Ghost Castle and Haunted House, and the concept re-purposed for The Real Ghostbusters Game (1986). Ol’ Uncle Everett has died, but he is not gone for good. 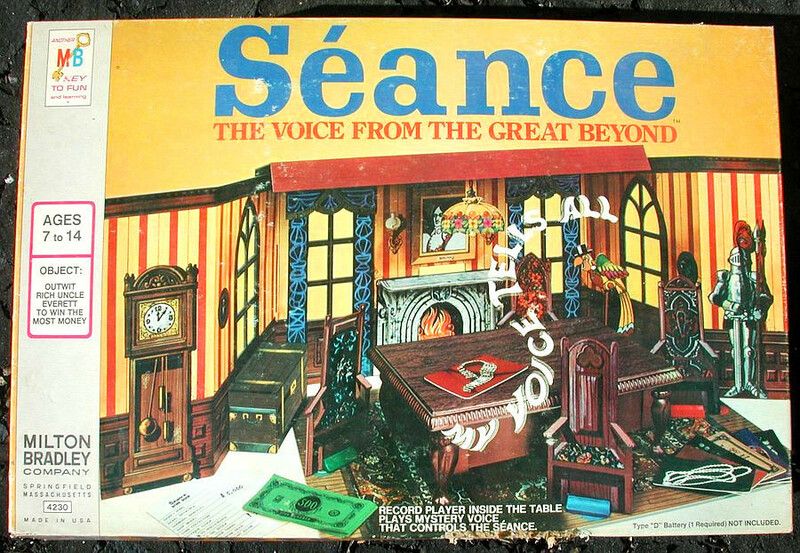 In Milton Bradley’s Séance, the rich spiritualist has summoned his nieces and nephews to his (cardboard, standup) Victorian mansion for a little afterlife convo. According to his will, he left each $20,000. Quite a bit more to his beloved Zeke the Parrot, but the séance allows them to win more, or lose it all. 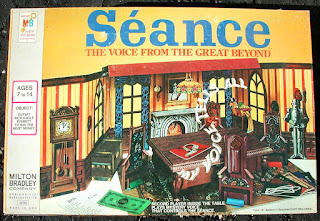 The game was pretty cool, with players represented as large chairs gathered around a table, which concealed a mini record player that conjured Everett’s “Voice from the Great Beyond” – courtesy a hidden switch. And, according to the rules, “When the game is over and the room is plunged into darkness, it is said that the image of Uncle Everett may be seen,” and it indeed is! The game is a sequel of sorts to 1971’s Voice of the Mummy game. Developed by Lakeside (also behind Disney’s 20,000 Leagues Under The Sea game), the Haunted Mansion game is one of many based on the (most?) popular Walt Disney World attraction. With pawns shaped liked the famous Doom Buggy, players roll the dice to escape the mansion first, but six spinning turntables, and four spinning ghosts can easily throw a buggy in the opposite direction. The artwork here is a highlight of the game, with familiar ghosts populating the board and stand-up mansion backdrop. Interestingly, the box features a depiction of the Disneyland mansion, even though the game itself is supposed to be based on the Magic Kingdom version. “… and ALL fun!” Mostly Ghostly will not win any awards for advanced gameplay (nor is it particularly original since skeleton assembly and glow-in-the-dark games had been around before), but hey, who can slight a game that encourages kids to play in the dark? 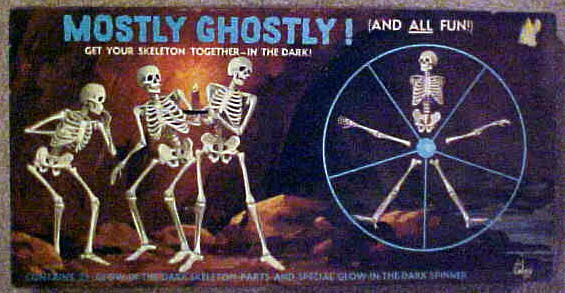 Using a spinner to pick up bones, this seems like a game that can be knocked out in 10 minutes, unless you count clean-up time of looking for missing bones in the dark. Also, not to be a stickler for game narrative here, but it’s worth mentioning there are no ghosts involved in this game, just irradiated skeletons. But "almostly" ghostly doesn't have the same ring to it, I suppose.